The Santa Maria Police Honor Guard posts the colors during the D.A.R.E. graduation at the Santa Maria Elks Lodge on Thursday. More than 800 sixth-grade students took the pledge to stay drug free and make responsible, informed choices during a Thursday morning graduation for the Drug Abuse Resistance Education (D.A.R.E.) program. 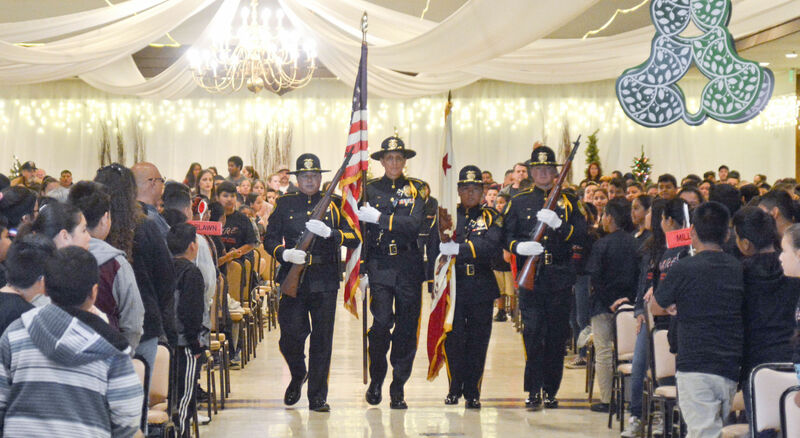 Claps and cheers filled the Santa Maria Elks Lodge as students, clad in black D.A.R.E. shirts and wristbands, from Santa Maria-area schools gathered to celebrate the end of their 10-week program. 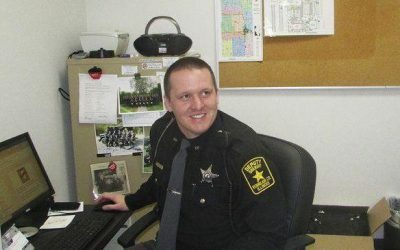 Mike Wheeler, the Santa Maria Police Department officer who has headed the D.A.R.E. program since summer, spoke about the significance of the logo. The D.A.R.E. curriculum, which was originally developed with a staunch anti-drug message, was revamped over the last decade to emphasize the importance of making healthy, responsible choices in everyday situations. Students are taught to not just avoid or refrain from ingesting illicit substances, but to evaluate every potentially deleterious situation and those who are involved with it. Seven students — one from each school in attendance — were presented by Wheeler as winners of the D.A.R.E. essay writing contest. Though unique in their delivery and content, all essays touched on the importance of making smart, risk-averse choices. Raymond Padilla, the Bruce Elementary essay winter, touched on his experience witnessing a family member struggle with tobacco use. As Wheeler prepares to educate a new cohort of students, he said he could not have more pride in his inaugural class of graduates. “Seeing the light in their eyes and their willingness to participate makes it easier for me to keep going,” he said.